Working with a lot of HVAC systems, most managers have come across the acronym BTUs. But what does it really pertain to and how is it relevant to the HVAC system? As someone who works closely with commercial buildings, it is important to know about BTUs. This gives you a better understanding of what is required to heat or cool the entire space of the facility. Understanding BTUs also provides a closer look at how effective the existing HVAC system can be while doing its job. British Thermal Unit or BTU is a traditional English system of unit used to measure heat energy. It is often used to specifically quantify the energy producing capacity of HVAC systems. This includes those located in commercial buildings and other types of heating and cooling systems. Normally, measurements done in relation to a building’s heating and cooling system is expressed in terms of the measured BTUs per hour that the air conditioner adds or removes in the atmosphere. An effective way to demonstrate this is when a furnace has a 100,000 BTU input rating, it utilizes 100,000 BTU per hour. Also, an annual fuel-utilization efficiency or AFUE is connected with BTUs as a way to demonstrate how effective furnace turns gas into heat energy. For a furnace producing a 95% efficiency rating with 100,000 BTU, it will generate about 95,000 BTU of heat energy for an entire establishment. The formula for calculating a facility’s cooling and heating BTU is different, although both of these have similar components that are needed to make a good calculation. Airflow volume or CFM is measured by calculating the operational fan speed and the external static pressure. Additional information about fan data can be found in the manufacturer’s installation guide. Measuring the temperature changes requires an instrument that can read the thermal variations inside the duct system. Wet-bulb thermometers can be used, however, it requires some expertise because they cannot be utilized for the cooling BTU equation. If you use them, they have to be calibrated to enthalpy estimations. 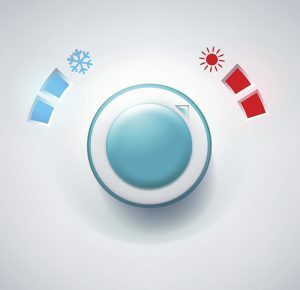 Heating and cooling systems have different BTU multipliers. The sensible heating formula has a multiplier of 1.08 which is derived from average air weight x heat of air x minutes per hour. Several factors also affect the measurement including elevational heights and thermal conditions falling or above 70 degrees Fahrenheit. The cooling or total heat multiplier is 4.5, which is determined by the weight of air x minutes per hour. Considering that HVAC is not a universal system, it is crucial to understand these bits of information before choosing one. Understand that there are also several factors to consider when choosing the appropriate heating and cooling system for a commercial building. This includes the size of the rooms, the type and quality of insulation installed, the size of the windows, specific location, and the height of the ceilings. All of this information plays an important role before making a decision. Ultimately, being aware of the BTU requirements of the facility will ensure that the appropriate HVAC system is installed. And, it will ensure that the facility receives the right working condition for its workers. Have questions? Contact us today.